Growing up as a preacher’s kid, Christmas was all about the birth of Christ and there was no focus on Santa whatsoever. We, as kids, knew that some kids truly believed Santa (Saint Nicholas) landed on the roof top in his sleigh and came down the chimney, delivered their presents and filled all the stockings. 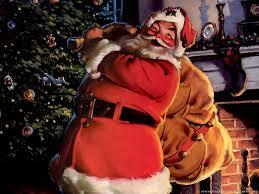 But, to us, Santa was a story of a man in a red suit who represented a nice concept of giving at Christmas. That was it. To our family, Christmas was all about Jesus being born in a manager. My husband’s family, on the other hand, did the whole Santa thing. When we got married, Joe firmly told me that, when we had kids, we would NOT allow Santa to be the focus our Christmases. He said that he felt betrayed and lied to by his parents when he found out that his parents bought the gifts and that they were not delivered by Santa. He couldn’t understand how they could lie to him like that. He felt like he was supposed to be able to trust that his parents, of all people, would be honest with him! It was a traumatic experience for him as a little kid. It is kind of creepy, if you think about it. You’re told a man in a red suit is watching you all the time. He knows what you’re doing. Your parents lie to you and use it to control your behavior at Christmas. Just my opinion. I guess I never understood the fascination with Santa. When Eric was a baby, though, we were given a stocking for him that had been hand-made by a family member. It was cute and thoughtfully given, so we bought stockings for rest of us to up as decorations. We decided they would be a good place to hold fun little gifts for each other, and they became a part of our holiday tradition. A few years later, my sister gave beautifully hand-made stockings for each of us and we put them up every year. Finding little “stocking stuffers” to put in each other’s stockings became part of our Christmas tradition. It was the fun way we ended our Christmas Day celebration every year by “opening” our stockings, stuffed to the top with fun little gifts, all at the same time. A Christmas tradition. As I said in my previous post, that first Christmas after Jason died was so hard. As I sat on the family room floor, crying while surrounded by Christmas decorations, I truly didn’t know how we were going to celebrate Christmas without Jason. I couldn’t even get the decorations on the tree because I was so raw with the pain of missing Jason. I could barely function that Christmas. We had tried to instill a sense of tradition at Christmas and create memorable moments for our family. How were we going to maintain our family traditions when our family was broken and missing Jason? One thing I remember is sitting on the family room floor that Christmas, trying to figure out if I should put up the stockings. I stared at the five nails above the fireplace. If I put all five of them up and we filled them with little gifts for each other as we usually did, I didn’t think I could handle seeing Jason’s stocking hanging there empty. If we put something in Jason’s stocking, it would be sad because he wouldn’t really be there to “open” his stocking with the rest of us. I couldn’t put up the rest of our stockings and not Jason’s. It would be obvious he was missing and would feel like a betrayal by excluding him. If I didn’t put them up at all or put them up and didn’t put anything in them, we wouldn’t be maintaining one of our traditions. Was that fair to the rest of the family? I didn’t know what to do. None of the choices seemed right, because it didn’t seem right that Jason was gone. We tried to maintain some of our traditions that year, just because we didn’t know what else to do. Our Christmas traditions had become woven into our family way of life. We didn’t want to cheat the rest of our family out of celebrating our traditional Christmas, but every tradition we tried to maintain that first year after Jason died just emphasized his absence. No matter what we did or didn’t do that Christmas, it was obvious Jason wasn’t there. It was so hard. That’s the thing about traditions – they are tightly woven into and become meaningful remembrances of a holiday. The hanging of the stockings was just one of many of our Christmas traditions that carried weight of meaning to us as a family tradition. Yes, it was just a fun little part of our Christmas morning, but every single tradition we had was part of the way WE celebrated OUR Christmas as a FAMILY. Now part of our family was gone. And there were so many more traditions we had as a family besides hanging the stockings, each one spotlighting Jason’s absence. Asian food for dinner Christmas Eve. Candlelight service as a family on Christmas Eve. Cinnamon rolls Christmas morning. On and on. So many traditions. Traditions. What do you do with your family traditions after a child dies? I think it takes many years to figure out which traditions to keep and which ones are too painful to continue. Some traditions can be bittersweet reminders of past Christmases before our child died. Some are put away for a while and may be started again at some point. Some are put away for good because they just hurt too much. New traditions are added in. For us, I think it continues to be a work in progress, this finding of traditions to add special meaning to our family Christmas. I guess I’m still not used to the idea of celebrating Christmas without Jason. I don’t think I ever will be. This entry was posted in Bereaved Parent, Child Loss, Christmas, Death of a child, Death of a Child, Family, Grief, Holidays, Jason David Carney and tagged Bereaved Parent, Child Loss, Christmas, Christmas traditions, Death of a child, Family, Grief, Jason David Carney, Santa, Stockings, Traditions by Rebecca Carney - One Woman's Perspective. Bookmark the permalink. What a beautiful idea and a wonderful way to remember your Eva. I’m so sorry for your loss. I wrote a blog about this same thing last week…stockings and traditions. Although our daughter’s stocking only hung above our fireplace for one year before she passed away, it is still painful to look at. I have decided to hang it each year though, and fill it with prayer intentions that we ask her to pray about now that she is heaven. I try to think of her as just playing a very different role in our family.